I'm rather lucky to be trawling the bustling bazaars of Rajasthan for handmade mirrored, embroidered and sequined accessories at very far from UK prices, but for those of you stuck back in the rainy, cold UK (sorry, I just had to get that in there) who like what you've been seeing here for the past few weeks but aren't lucky enough to be able to jump on a plane to India for a shopping trip (or enough pennies to pick up an Antik Batik alternative as seen here), I've found you a very accessible alternative! 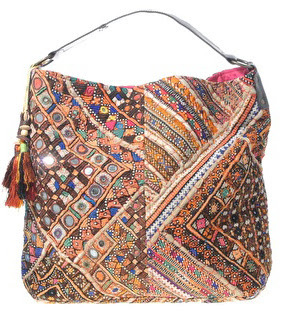 ASOS are currently selling this beautiful mirrored, patchwork bag. Perfect for that bohemian summer vibe. Snap one up for £45 - it's no 300 rupees but, hey, at least your saving yourself a couple hundred on a plane ticket!